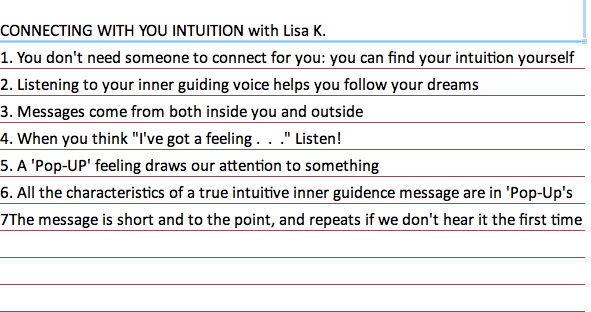 IndexCard Cure™ asked renowned author and speaker on Intuition, Lisa K. to give us an introductory lesson in connecting with our intuition. Intuition Pop-ups – Your Inner Guidance by Lisa K.
How do you know when you are receiving true inner guidance from your intuition, and when is it real and not just your imagination? We all can receive that inner “divine guidance” at any time; you don’t need someone else to do it for you. Of course, you can go to someone if you want to, but isn’t it better to get your messages directly? Being able to receive your inner guidance is really the best way live your life’s path because you’ll always be guided to what’s right for you. You can fulfill your soul’s desires by listening to what your higher self wants you to do. The Universe, then in turn brings to you an abundance of great things because we are all meant to expand and grow to follow our soul’s desires. I’m going to begin with the simple steps of just recognizing what an intuitive message is, and how we all can easily work with them. I won’t be able to go into depth on how to get detailed messages from your intuition, because that would require a lengthy workshop to teach you, but I can get you started. The way to begin is to learn the different ways we get intuitive messages and how to practice receiving more of them. You can still get quite a lot of guidance and direction from simple messages which will help you make choices to make your life’s path easier. The first step is to understand how intuition messages come to you. You can receive a message from inside of you or outside of you. For most people, the easiest way to start is to tune into your feelings. Usually, the messages we receive inside of us can be an emotional feeling, such as feeling happy and comfortable, or feel repulsed and tense. You may also get, what I call, a pop-up message through feelings. Pop-up feelings are one way our guidance is showing us the way. Have you ever had that pop-up feeling? Being drawn to something that seems to pique your curiosity? It’s as if you’re thinking, “I wonder what’s down that road?” Or the road looks like it leads to some place interesting but you can’t quite see what it is. Pop-up feelings are like impulses but they are different in that there is no strong Ego attachment to it, and there is no nagging, nor obsession connected with a pop-up feeling. You can let the pop-up feeling go. Pop-up feelings are often light and don’t feel burdening. It may feel like a slight urge, or as if you are drawn to something. An analogy might be that it’s the same feeling you get when a friend says to you, “Hey, come here look at this!” You have a feeling of openness and, of course, are drawn by your curiosity to find out what is so interesting that they want to show you. Our inner pop-up feelings have all the characteristics of a message of intuitive inner guidance. The pop-up feeling or message, is repetitive, it is light, never scolding, it doesn’t feel contracted or burdensome, it is positive and it is short or to the point. The pop-up feeling of being drawn or subtly attracted to something is a good way to receive which direction your being guided to. That is how we receive divine guidance. Here I am after using my intuition in everything I do, years later and my life has been changed in a way that has expanding my happiness, brought me abundance and I know I’m on the right track because it all intuitively feels right!